Ghana’s Permanent Representative to the United Nations (UN), Martha Ama Akyaa Pobee has advised pupils from various schools in Ghana who participated in the 2019 Model United Nations to help in small ways to make the world a better place. 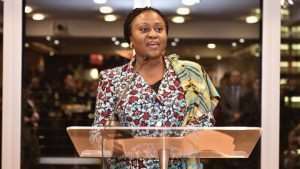 She made this appeal when Ghana’s Model UN delegates and their tutors paid a visit to the Ghana Permanent Mission in New York on April 1, 2019, to familiarize themselves with the activities of the mission. “We advance the issues that are of critical importance to the government and the people of Ghana. We do what the people of Ghana want to see done. Whatever we do is tied into government’s policy and to its implementation at the very local level, whether in the area of health and or climate change”, Ambassador explained the work of the Permanent Mission to the young pupils. She admonished them to contribute to the work of the United Nations and speaking on the preservation of the environment as an example, she asked them to ensure clean surroundings and to conserve energy by not leave lights on when they are not needed. “We must do everything we can, no matter how small to advance the objectives and goals of the UN. So if you are a supporter of the UN, then you must take active steps wherever you are”. Model United Nations, also known as Model UN or MUN, is an extra-curricular activity in which students typically play the role of delegates to the United Nations. This activity takes place at MUN conferences, which is usually organized by a high school or college MUN club. Ghana’s delegation discussed the Biafra War, which took place in Nigeria between 1967 and 1970 in the Security Committee of the UN as well as on the subject of mechanisms for sustaining post-conflict economic growth. Kuuku Egyensaim Ampah and Jacob Idan were given the Secretary General’s Award and the Honorable Mention went to Naa Akushia Otoo and Efua Addo Yebo. Mrs. Vivian Serwaa Gyasi, Head of Chancery of the Mission also added the need for them to continually help the realization of the goals set out by the United Nations.